Designed for building owner and managers. The features built into the Performance Driven Management (PDM) system are designed for building owners and managers to provide a comprehensive inspection, management, and innovation to underpin success. The path to success begins with objective, accurate, consistent data collection. PDM draws on 40+ years of industry data and experience and over 900,000 data points to quickly create industry-specific specifications matching the desired cleanliness level (APPA or Quality). PDM automatically produced details specifications by room types, items and conditions– the kind of information that managers will need to effectively manage their facilities. Objective, accurate and consistent data collection is the heart of the PDM application and is used to manage the key metrics supporting program success: cleanliness, maintenance, customer satisfaction and environmental health assessments. Although PDM is a rapid-start system offering default specifications, room types and items for many industries, it is fully customizable. PDM allows for customized cleanliness standards to be set for your sites, building groups, buildings and room types. When you want to customize and optimize your cleaning program, you realize that priority buildings and rooms within your buildings simply require a higher standard of cleanliness. Would the loading dock have to be as clean as the executive board room? Of course not. So your inspection program should be flexible in setting targets and reflect this dynamic. PDM enables organizations with hundreds of buildings to manage these buildings in a hierarchy of accounts (for different corporate divisions of entities), sites (usually geographically based), and building groups (for buildings with similar uses or arranged by specific manager of those buildings). Even specific areas within buildings can be tracked and reported separately. PDM realizes that some items in a room may be more important then others; and as a result, their cleanliness quality is more vital to your success and they should count more. PDM provides the option of adding a weight to individual items so you can customize their impact on your program’s success. PDM allows you to easily import your existing building list and building characteristics into the application. We provide a simple Excel template for you. Then in a matter of seconds you can populate the application with 10, 50, or even 100+ buildings or more in minutes. Managing Performance: The Report IS the Product! PDM reporting is comprehensive and actionable. It goes beyond mere descriptive reporting to provide guided analytics that managers can use for excel at preventive management. This is a big deal! Innovative reporting is central to the value PDM provides. The reports provide valuable insights for managing the performance of your cleaning program. PDM tracks four key performance metrics (KPIs) to effectively manage your cleaning program with just a few hours a month. Cleanliness: Cleanliness appearance is measured and is based on how many dirty (defective) items were found as a percentage of the total items inspected in a stratified random inspection model. Customer Satisfaction: If your occupants, staff, customers and top managers are unhappy, the best cleanliness appearance won’t help. This metric surveys random and targeted “customers.” Satisfaction ratings are determined based on actual spot interviews. ATP Levels: How do you measure the “health” of a building? Today’s measurement strategy is centered on ATP “touch point” hand–contact measures. ATP stands for adenosine triphosphate and measures the level or organic matter of perspiration, soil and other oils left by touching surfaces with hands. An ATP reader is needed to obtain a reading and enter it into the application. Continuous Improvement: The most effective cleaning programs excel at identifying and preventing service failure. The continuous improvement metric measures the ability of cleaning program to prevent future failure by removing the conditions creating failure and keeping those defects from coming back. These PDM metrics offer a well-grounded view of your new ability to measure, manage and improve the performance of your cleaning program. PDM reports provide analysis and data that allows management to go beyond fixing a problem by identifying either the systemic or the individual behavior that is causing performance failure. Through a series of tiered reports from the top management down to the individual supervisor, PDM can bring the right information to the right people, with the right strategies to prevent failure and improve results. PDM provides a comprehensive, automated, multi-level, multi-dimensional reporting structure to provide analysis of key aspects of your cleaning program. This reporting structure was developed using over 40 years’ worth of data and experience in achieving results. After each day of room-based data collection, PDM generates both a room detail report for immediate problem follow-up and a summary report of the day’s activities. This is a powerful information set for staying ahead of the potential service failure and possible customer complaints. PDM allows for individual building assignment of supervisory responsibility. This means that building managers or supervisors responsible for a portion of your building portfolio will only get the reports focused on their specific buildings, or areas within those buildings. Not all users need to receive all the reports– there over 100 pages of performance information available! PDM allows you to designate various levels of report content; there are internal, client, and service provider reporting levels. This separation allows the top management to receive a brief, high-level report page, while facility and area manager’s receive those results that matter for their specific level. PDM can automatically deliver up to 26 report levels depending on your need. PDM comes with a user guide that reflects the expert knowledge from the cleaning industry in reviewing, advising, and supporting janitorial cleaning programs. This guide will allow each client management level to ask the right questions of service provider management and supervisory staff. In turn, the guide will provide service provider managers and supervisors the information needed to answer these client questions. PDM reports are available in HTML for web viewing, and PDF for downloading, printing, and distributing. Please see the Report Guide for more specifics. PDM has been designed to measure service performance in the most efficient and effective way. The inspection process can be a time consuming process that involves walking and evaluating every item in a room. PDM minimizes this effort by pre-organizing inspection data to make collection simple and easy to do. The fundamental requirement of any improvement system is to have data that is objective (not subjective), provable, un-opinionated, and reliable. To this end, PDM is an attribute-based inspection program. What does this mean? It means that each surface or item found in a selected room is free of a provable unsatisfactory condition. These provable condition are called attributes. For example, “dust” is an attribute; in measuring service success or failure, items are inspected in a room to prove the presence (or absence) of dust as one of 10 typical attributes. Likewise, “spot” is also an attribute; it means a carpet has a spot, or it does not. The attributes found in a room must be present on the items in that room for a room to be rated as meeting the quality standard established. This simple-but-powerful construct allows you to use the data gathered reliably in establishing a preventive strategy for improving the quality and performance of your facilities. PDM was designed to be intuitive and allow and inspector to perform an inspection quickly and accurately. Below is a quick review of the PDM data collection screen. The items for a room are displayed in a simple row and column format with the conditions to the right of the items. You select any item, then add the defect in a touch-and-touch, one-second data collection event. Sometimes a picture is needed to reinforce you inspection evaluation. PDM allows you to capture a photo of and room or item in the room and include the photo in the available reports. To guide an effective response to problems or to communicate critical information, PDM gives you the ability to capture notes on any item that is inspected and add a note to each room inspected. PDM includes a customizable customer satisfaction survey form that tracks customer type and survey response for every room inspected. Customizable customer types and comments make collecting your occupant’s opinions quick and easy. PDM is designed to work with or without a persistent Internet connection– you can complete inspections even when there is no network connection to the PDM report server. Once a network connection is found, the application will send the data to the server automatically. PDM enables you to record ATP readings on an item by item basis in any room inspection. ATP reports can be created either as a stand-alone report, or as part of an integrated report alongside other performance results. PDM tracks the time it takes to complete each and every inspection in each building and room, allowing you to optimize your inspection time and manage the performance of individual inspectors to highlight the need for follow-up coaching or re-training. PDM has seven (7) separate role user types from Super Admin to Vendor. These multiple roles allow you to define and set permissions on information made available to different user levels in your organization. PDM comes with a list of common room types and items as well as industry-specific room types and items to quickly set up your inspection program. Of course, the lists are fully customizable; you can add specific room types and items particular to your buildings and rooms. PDM has been designed to integrate into most maintenance management system that has the ability to accept programmable interfaces. 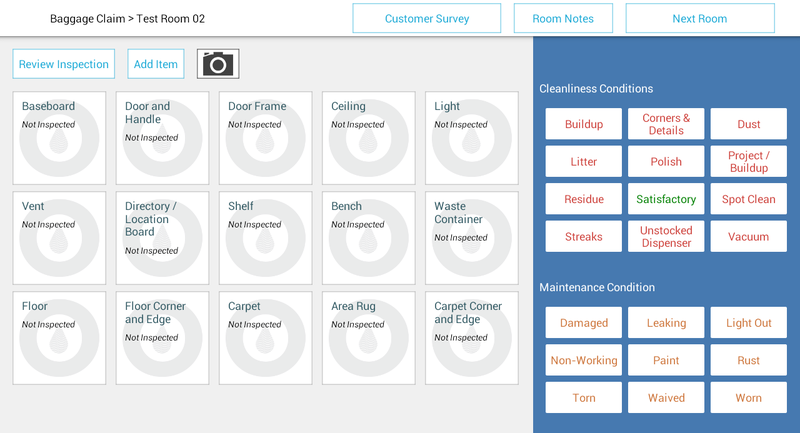 This allows maintenance issues to be reported in real-time as the rooms are inspected.